After spending the night at anchor off Ardbeg Point, HEBRIDEAN PRINCESS continued her cruise this morning with a short sail up the Cowal coast and into the Holy loch, where she anchored. Passengers were ferried ashore to the Holy Loch Marina for an excursion to the nearby Benmore Botanical Gardens. Following this call, HEBRIDEAN PRINCESS left the Holy Loch, as seen above passing Strone Point, and cruised up Loch Long. Later this afternoon, she headed back down the Firth and berthed at Fairlie where her passengers will disembark. 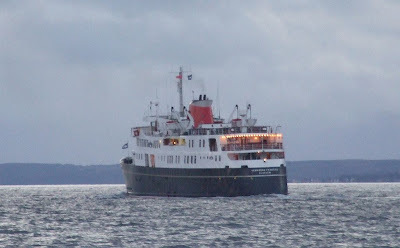 This final shot of HEBRIDEAN PRINCESS shows her heading southward past Dunoon.